Animals may be exposed to a number of various diseases. It’s up to you how extensively you want to test. Keep in mind, this testing can become very expensive. Also, be aware of false-positives. If you are unsure about a test result, consider re-testing with a different type test (ie: PCR vs. Elisa, milk vs. blood vs. stool) or a different lab and compare results. Buy from credible sources that are aware of disease and prevention. Paying a little more for a healthy cow will save $$ in the long run. We like to see a maternal line that has longevity, which is a great indicator of health! Most states are TB free. 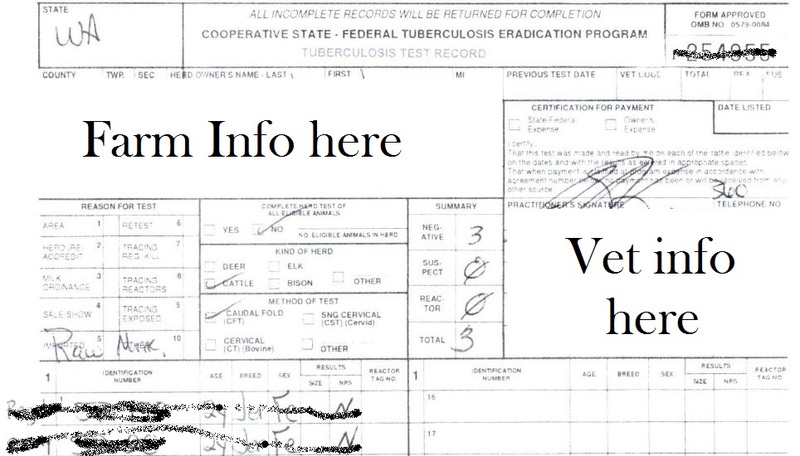 Bovine tuberculosis CAN be transmitted to humans and make them sick. So therefore, though it is not very prevalent, it is important to be aware of TB. (TB testing is required in our state for raw milk producers.) Clinical signs of the bacterial infection are not easy to identify as TB. Prevention: If in California, people have become sick from TB from cattle, so definitely extra caution in that state. Avoid housing animals in enclosed areas with poor ventilation. Avoid feeding/watering where wild animals can co-mingle with your herd. If you attend a fair, avoid “community watering” areas for the animals! You may have heard an older person speak of “undulant fever” – they are referring to Brucellosis. In the cow world, it is known as “Bangs” or “contagious abortion.” Brucellosis is eradicated within the United States, thanks to a federal eradication program, EXCEPT for populations near Wyoming, where officials refuse to vaccinate wild bison populations. Many states do not allow transportation of animals unless they are Brucellosis vaccinated, so check before moving or selling cattle! If not vaccinated, Brucellosis can be checked for in milk or blood samples. 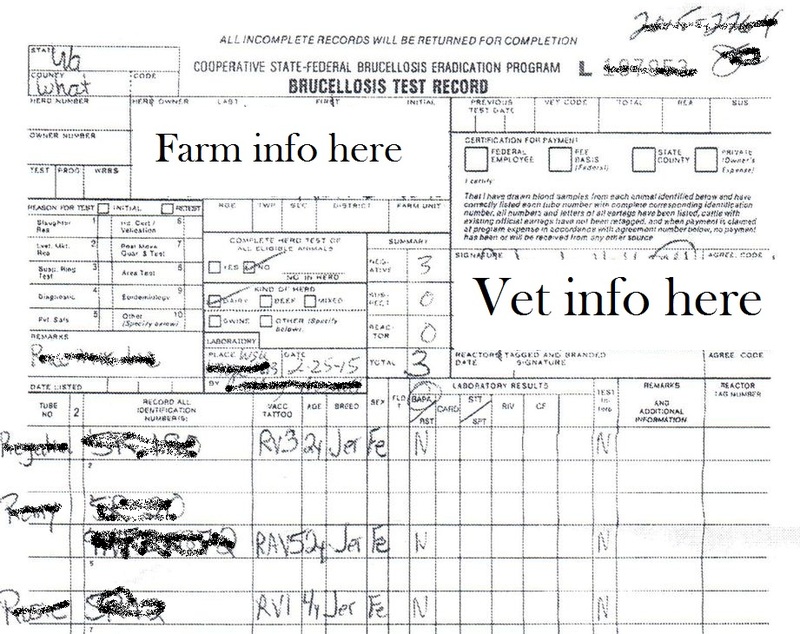 A vet is required to vaccinate/tattoo/tag/record your animal. The animal should be vaccinated between 4-12 months old. If not vaccinated as a calf, an adult cow can often be vaccinated after a blood test confirms she is negative for the disease. If you have a breed-specific registered & tattoo identified animal, you can ask for the vet to NOT put in the metal tag. Instead of the tag number, they will use the animal’s registration number. Prevention: Vaccinate calves. Adults can be vaccinated after being tested and proven negative. Blood (Elisa/AGID, antibodies) and manure (PCR, organism) tests. We always tested the herd with blood and manure samples at the same time. PCR is best for detecting already sick cows, but AGID is better for cows not showing symptoms, so both tests are valuable. For more in-depth discussion on testing types: Johnes: What Tests? 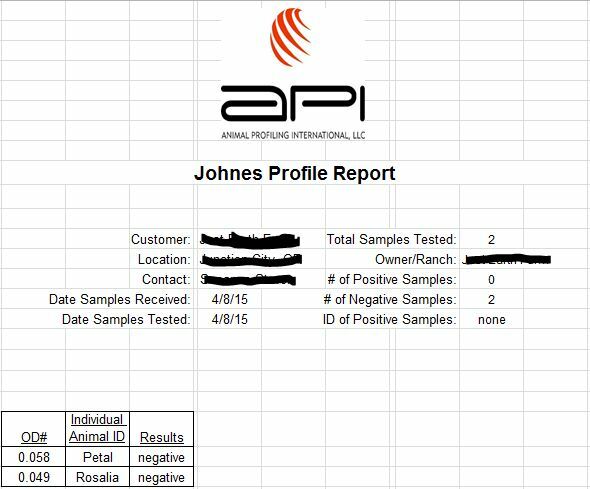 Your vet should be able to help you send in a sample for Johnes testing. Note: testing can take up to 6-8 weeks to get results back! Prevention: If you test your animal, before purchase, this is probably THE most important test to do! Because testing is the only way to monitor Johnes in your herd! There is NO cure. In the dairy industry, Johnes is a very touchy subject and not every state is as intense about eradicating Johnes as others. Most herds have dealt with Johnes, whether they know it or not. There is a Johnes vaccine, but the use should be carefully discussed with your veterinarian before deciding whether to give or not. Do not feed raw milk to calves from their own mother if the mother has signs of Johnes. (Powdered colostrum and powdered/pasteurized milk are safer alternative feeds in this situation.) If the calf is a heifer that you plan to raise as a replacement, the calf should be removed immediately from the pen, ideally without the calf touching anything in the birthing environment. The heifer should also be carefully monitored through testing throughout her life. Probably the most useful test to anyone purchasing a dairy cow is milk testing! Prevention is all about cow health from udder health to general cleanliness. “Somatic cell” testing is a cheap, useful indicator of general health and udder health. Bacterial cultures or DNA testing from individual quarter(s) can help identify specific pathogens. Seeing accurate signs of pregnancy are often difficult or impossible. To verify pregnancy, we highly recommend preg checking cows, otherwise you assume the risk of a non-pregnant cow going 9 months unbred at your cost. Should I wait to drink her raw milk until she has been tested? Can I still drink home pasteurized milk? What are the chances my new heifer has any of these diseases? I bought her as a bottle calf off a small Amish dairy in Maryland. She is a jursey and she is already in my heart. She will be our homestead family milk cow for raw milk consumption. What tests should I absolutely have done? Getting a vet here is 100$ travel expenses +++. You don’t need a vet out. Wait until she’s calved, then you can send in a milk sample to AntelBio – they test for a LOT of diseases at a very affordable rate. I loved your article on diseases in cattle. I just got a positive for Q fever on a cow I bought from a dairy 2 weeks ago. I was hoping you had any information on this disease? I am so worried. I don’t know if my cow will recover, or if I should put her down. I only have 2 mini jerseys and she was to be my heifers compainion and our family milk cow. Now I am looking at whatever I can find on it and I am lost! I couldn’t figure out how to comment, please excuse my message on your post. You can probably find most accurate information about the disease by looking at AUS sources: http://www.dairyaustralia.com.au/Animal-management/Animal-health/Animal-health-fast-facts/Abortion-and-infertility/Q-fever.aspx Keep in mind, the US is relatively “unaware” of this disease, there is no vaccine for humans or animals in the US (that I’m aware of), and if your animal tests positive, it may be recorded in a registry. FAQ: If I had a cow with BLV, can another cow get it even if the infected cow is long gone? I compared BLV to HIV. First, some people get HIV and never AIDS. Second, think of how HIV/AIDS is transmitted – through blood. So, occasionally a calf can get it inside the mother. It helps me to think of HIV as a comparison.I’d recommend anyone purchasing a cow to have thorough testing done beforehand. “Cheap insurance” It puts everyone on a level field of honesty and then if the cow comes up positive for something 6 months later, you know you all did the best you could to get a healthy cow and that’s life.Buying a lot of cows from different places can bring in all sorts of problems. I see you have multiple animals, and that can be a consequence of “buying around”. As close as you can get to a closed herd (meaning no buying of animals from different farms) the more protected you will be against new diseases. Staph Aureus is a terrible plague at a farm I know. They sold off all but about 15 older cows and then calved in 40 young cows. Guess what? Those young cows are coming in with huge staph counts. 😦 Very sad. FAQ: A person got bit by a tick, wondered about Lyme’s disease, and then wondered if cows get tick-borne disease? Very informative….thank you for sharing !